Beautycounter is having an AMAZING sale this week- they usually never discount their products. You’ll get 15% off AND free shipping for any purchase over $50!!! If you’re looking to clean up your makeup and skincare, these are great holiday gifts, both to give and receive. For other holiday gift ideas, check out my Gift Guide here. Leave a comment on the Gift Guide post for a chance to win one of the products mentioned in the post! Giveaway closes on December 7, 2018 at 11:59 CST. 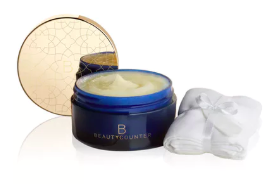 Without further ado, onto the Beautycounter Holiday Sale Must-Haves! This body set is the ultimate in pampering and contains a beautiful Sugar Body Scrub with a Lemongrass scent, Glow Shimmer Oil for beautiful, party-ready skin, and our classic Body Butter. This set would make a great gift for your mom or a girlfriend who’s in need of some serious self-care! This set contains my two favorite skincare products from Beautycounter. The charcoal products are great for detoxifying your skin. You can use the charcoal bar soap as a daily cleanser, and the mask a few times a week to keep pores open! You can use the mask as acne spot treatment overnight- wash it off in the morning and you’ll be amazed how much smaller spots get! 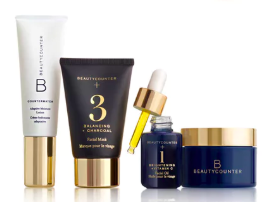 This skincare set gives you exactly what you need to get started with Beautycounter. It includes #1 brightening oil (which reduces dark spots and brightens skin), #3 detoxifying Charcoal Mask (great for breakouts as a spot treatment), Beautycounter’s best-selling Cleansing Balm (the Swiss Army knife of skincare, see more deets at right), and the Countermatch Adaptive Moisture Lotion (an amazing daily moisturizer!). Try this set and you’ll be hooked on safer skincare! This deluxe size will likely last you a year! It costs only a few dollars more than the regular size but you get 23% more. This palette is just GORGEOUS and definitely lives up to the word “necessary” in my opinion. Confused about how to apply eyeshadow? I was too, so here’s a little tip for you- the vertical columns actually make up mini eyeshadow trios! The lightest color goes on the eyelid, darker in the crease, and darkest in the outer corner or as eyeliner. Instant glam! This mascara works like a charm. The formula is just wet enough to give lashes definition and volume without being clumpy or flaky. It’s buildable if you want more drama and stays on all day unlike other non-toxic mascaras. Definitely one of the best safer mascara options I have found! 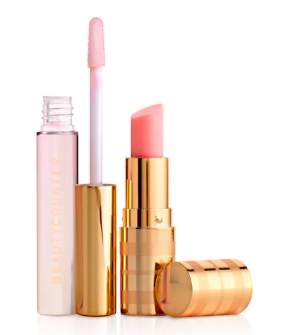 Our Beautycounter lip glosses are some of the best nontoxic options I have found. They aren’t sticky and are slightly minty and refreshing! This set packages up three of my favorite colors to use this holiday season. 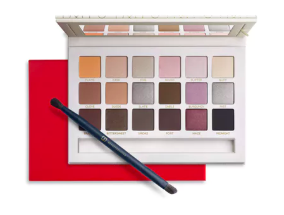 These neutrals go with everything and can be used for everything from daytime activities to holiday parties! I love this lip duo because it’s basically fool-proof. This nontoxic set reacts with your body chemistry to make the perfect shade of pink for you. No shade-guessing necessary! 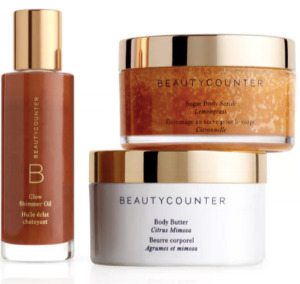 Have you tried any of these Beautycounter products before? What would you love to buy from this holiday sale? Let me know below!